If there is one thing to take away from the Naples real estate market it is this; more people are back for season and more homes are on the market. Even the tourist trade is up as more hotel rooms are booked for November and December than last year. 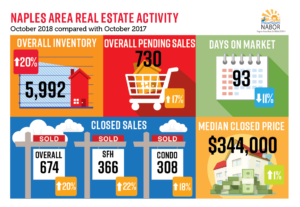 Here is a great informational graphic where you can see inventory building, pending sales up as the season accelerates, and other key stats. Our readers know all real estate is local so let’s look at some specific Naples areas. Remember as a “rule of thumb” inventories may be indicative of future prices – below 12 months prices rise, above 12 months prices drop or so the theory goes. Here are the inventory levels and the month over month trend.